Observing the above trend, the HTTP Working Group (HTTP-WG) kicked off a new effort to take the lessons learned from SPDY, build and improve on them, and deliver an official “HTTP/2” standard: a new charter was drafted, an open call for HTTP/2 proposals was made, and after a lot of discussion within the working group, the SPDY specification was adopted as a starting point for the new HTTP/2 protocol. We’re happy to have contributed to the open standards process that led to HTTP/2, and hope to see wide adoption given the broad industry engagement on standardization and implementation. The coevolution of SPDY and HTTP/2 enabled server, browser, and site developers to gain real-world experience with the new protocol as it was being developed. As a result, the HTTP/2 standard is one of the best and most extensively tested standards right out of the gate. By the time HTTP/2 was approved by the IESG, there were dozens of thoroughly tested and production-ready client and server implementations. In fact, just weeks after the final protocol was approved, many users were already enjoying its benefits as several popular browsers, and many sites, deployed full HTTP/2 support. 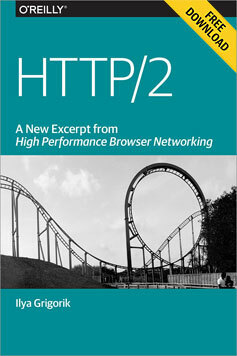 Editor’s note: If you’re interested in learning more about HTTP/2 and how it can eliminate the need for workarounds like sharding, concatenation, spriting, and inlining, check out Ilya Grigorik’s Yesterday’s perf best-practices are today’s HTTP/2 anti-patterns session at Velocity 2015 in Santa Clara, CA on May 29, 2015.